The Dockwa team loves being out on the water, exploring new harbors and sharing what we learn with our fellow boaters. We also love when we luck out meeting the resident expert of a harbor we're not yet familiar with, and he happens to be more than willing to illustrate why every boater needs to visit his stomping grounds waters. This week we welcome Chris Gasiorek to chime in on the Dockwa Boater Blog: Chris not only heads up the Watercraft Preservation and Programs at Mystic Seaport, he's also a lifelong mariner who makes his home in Mystic, Connecticut, year-round, so he's very familiar with its quirks and best qualities. Read on for his insight as to how to make the most of your stay at Mystic Seaport Marina. As a lifelong mariner and cruising yachtsman, I’m amazed at how great Dockwa is for planning a cruise. All the information about marinas, including prices, services they provide, and amenities are nicely laid out for comparison. Some marina amenities, however, don’t quite fit within the normal descriptions of services and amenities – amenities such as Historic Ships, Kid Friendly Attractions, Living History, Steamboat Rides, and Traditional Shipbuilding. 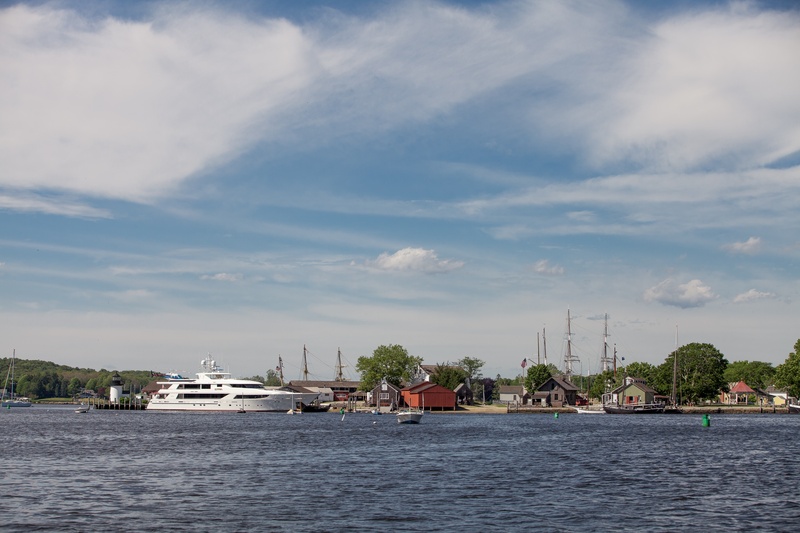 One marina has all of these and more: Mystic Seaport. 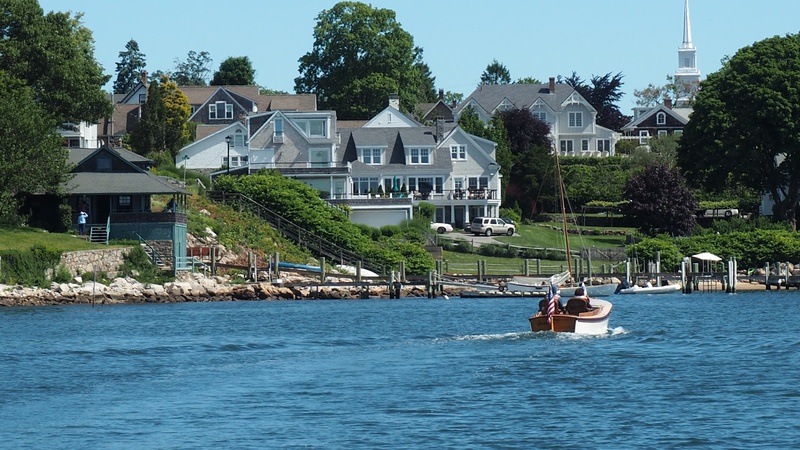 When you approach Fishers Island Sound and the Mystic River from the west, it's easy to wonder if you've slept through a few watches and found yourself in Maine. The sandy bluffs of Long Island Sound quickly transform into the beautiful rocky New England coastline. As you start your trip up the Mystic River, you'll leave the quaint village of Noank to port as you transit north up the well-marked waterway. 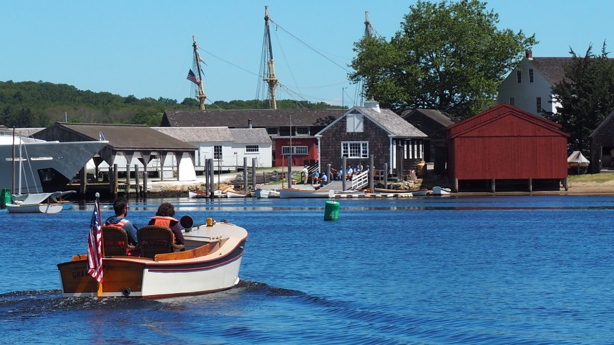 As you cruise by some of Noank’s great seafood restaurants – Costello’s Clam Shack, Abbotts Lobster, and Fords Lobster – you can imagine the shipyards that once dotted the coast of the Mystic River. More than 600 ships were built along the banks of the Mystic River, from Noank fishing shacks to clipper ships built for the California gold rush. Mystic provided captains and crews for those voyages as well, including one local captain who successfully rounded Cape Horn 84 times. After a few curves of the river you’ll see the Mystic Railroad Bridge ahead. The operator monitors channel 13 and will open if there are no trains approaching. Once through the railroad bridge, you'll suddenly feel like you are cruising down Mystic’s main street. 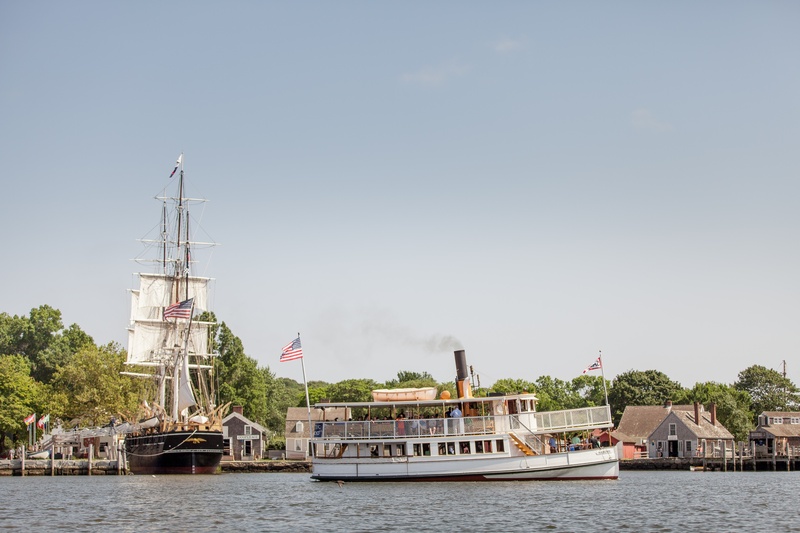 Take the cruise slow and you can see some of downtown's highlights that you'll get a closer view of on a later walk into town: Mystic Riverfront Park, Red 36, The Daniel Packer Inn, Mystic Museum of Art, and Drawbridge Ice Cream are all an easy walk from your slip at Mystic Seaport. 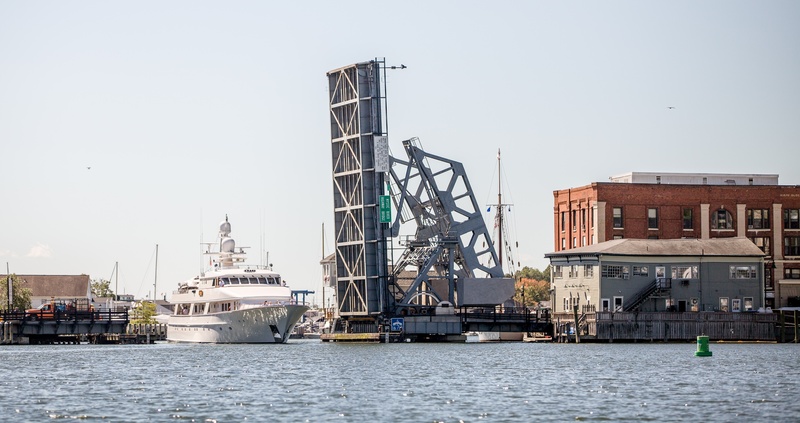 You may have a short wait for the historic Mystic Highway Drawbridge (who also monitors channel 13) to open at 40 minutes past the hour. I recommend you make use of the time practicing your royal wave and ensuring you are not dragging any fenders – passing through a bridge lined with camera-wielding tourists on both sides will make you feel like you're arriving on the Queen Mary. 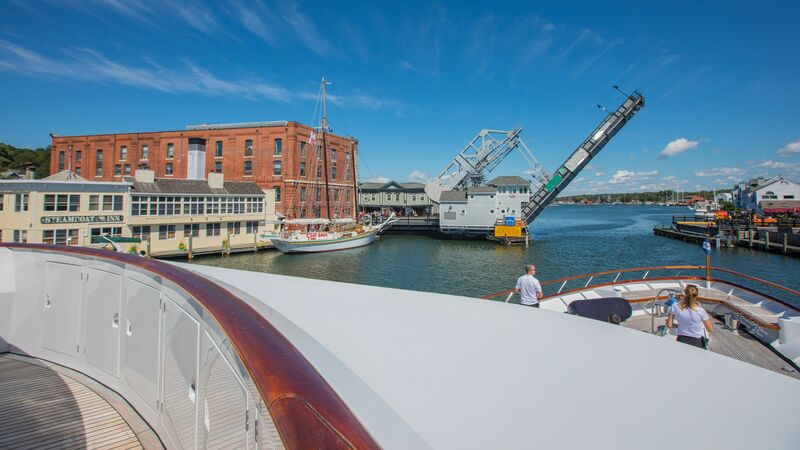 If the passage feels narrow just imagine being at the helm of the Charles W. Morgan during her voyage in 2014, or how the captain of the 160' motor yacht with a 30' beam felt when he visited Mystic Seaport twice last season! Passing through the drawbridge is like passing through a time machine. The view before you hasn't changed much over the last two centuries: the stately homes of Captains Row to port, Schooner Wharf to starboard and Mystic Seaport straight ahead. 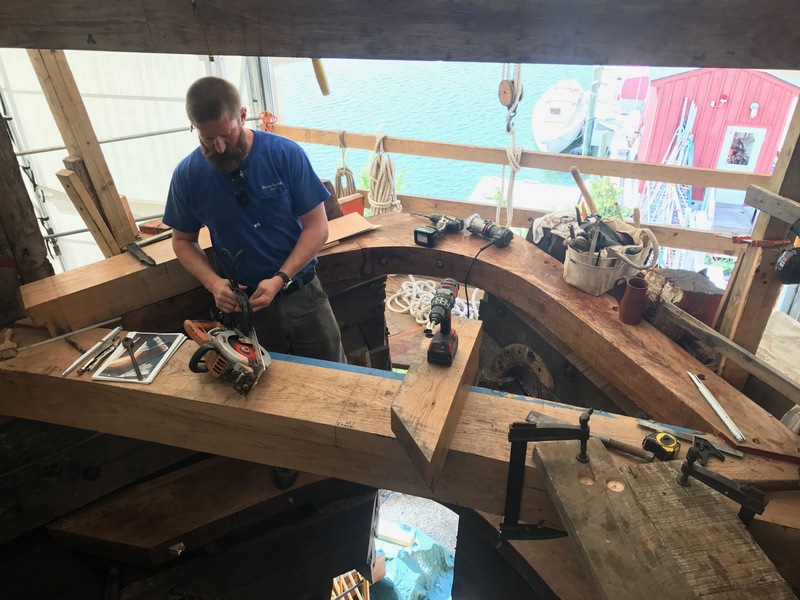 You may even hear the same sounds of shipbuilding from years ago as you pass the Henry B. duPont Preservation Shipyard currently restoring the Mayflower II from Plimoth Plantation. Left: A Shipwright restoring the bow of the Mayflower II. After passing through the bridge you can hail the Mystic Seaport Dock Master on Ch. 68 to receive your berthing instructions and ensure that the dockhands meet you on arrival to ensure a safe tie up. If you're interested in learning more about seamanship, boat handling, and safe tie-ups, I highly recommend a visit to the Museum by boat on June 2, 2018, when local experts will be on site for some hands-on seamanship training free with at least one night dockage. 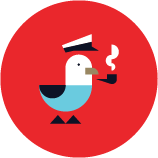 Reserve your spot on Dockwa today. And now you have arrived! To a 5-star marina, a quaint whaling village from more than a century ago, and a modern Maritime Museum all in one. Left: Mystic Seaport Marina’s Dockhands make your arrival easy. With your museum entry included in your dockage, you now have a front-row seat for tours of the historic ships – including the Charles W. Morgan, the oldest merchant vessel afloat – as well as live demonstrations of setting sail from aloft, launching and rowing a whaleboat, and making ships fittings in a forge. Perhaps you’d like to take a cruise on a historic vessel aboard the 1908 steamer Sabino (Captain Dave may even let you steer), the catboat Breck Marshall, the rowing and sailing craft from our boat livery, or even a private river cruise on a classic yacht. Say goodbye to rainy day cabin fever aboard! You can keep busy and active with Mystic Seaport's indoor exhibits, shows in our Planetarium, special exhibitions, and activities for your younger crew including boat building, children’s museum, and hands-on activities in the Discovery Barn. It’s just a short walk into town (or tender ride to the town dinghy dock) to experience some great shopping and dining- Mystic has become quite a foodie town lately. My local favorites are the Oyster Club with its Treehouse deck, the Engine Room, and the Pub at the Daniel Packer Inn. Upon your return to your boat you will be treated to my favorite experience at the Seaport- walking through the Seaport Village at night- walking the paths past the historic ships and village in the evening is about as close to time travel as you can get. Cruising in company with friends on other vessels? Let Greg the dock master know when you make your reservation and we can arrange private tours of our collection of over 500 historic watercraft and marine engines. You may need to make a few return visits next year to explore our upcoming special exhibitions planned by new Curator Nicholas Bell including Murmur: Arctic Realities, The Vikings Begin, and Death in the Ice- The Mystery of the Franklin Expedition. 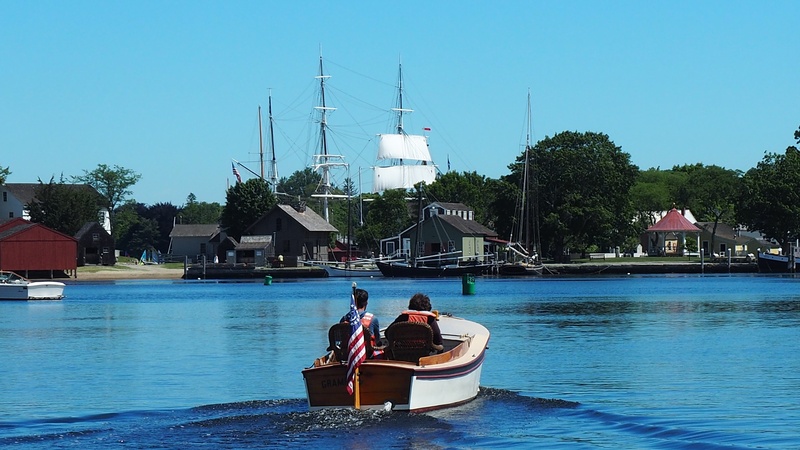 Now that you have seen some of the special amenities available at Mystic Seaport, plan your stay! 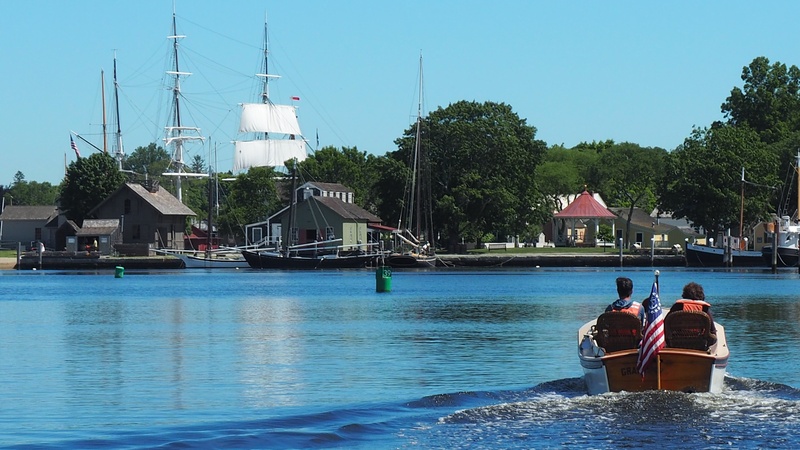 Once you're ready to cruise over, you can watch this short video with Captain Nicholas Alley of the Schooner Brilliant to introduce you to the Mystic River. Chris Gasiorek is a USCG Unlimited Tonnage Master who has sailed the East Coast from the Great Lakes to the Caribbean as well as Europe, Africa, and the Far East. He is also the Vice President of Watercraft Preservation and Programs at his favorite marina: Mystic Seaport.